Summertime, and the living is umm--not as easy as Mina had hoped. But, she finally has a full-time job, working alongside her new boyfriend, Jack (that is, Chef Jacque, when they’re at Squirrel Run Acres.) That’s good, right? Except that poor Mina and Jack have been working together a lot lately--specifically fourteen hour shifts in a sizzling kitchen--for months. When tempers flare hotter than fat on a fire, Jack steps up and splurges for a romantic get-away to Cape May Point, New Jersey. All is forgiven and soon Sunset Beach winks from the distance, until Mina’s stuck with dog sitting duties for Jim, her buddy Bauser’s three-legged dog. Complicating the canine conundrum is Bauser’s last minute plea to deliver Jim to a client location, in Bumville, New Jersey. No biggie, except that Bumville lies in the polar opposite direction from Cape May. And Vito and Miriam also happen to be visiting the client--who is none other than Vito’s niece, Helena Pryzchntchynzski. Oy. Further jeopardizing their journey through Jersey is Jim’s discovery of Babette Bernstein. Her murder launches a connect-the-dots of corpses that ripples dangerously around Mina and Jack. Oh--and the kidnappings, plural--are a little scary, too. Will Mina and Jack escape the bad guys? Will they survive their first vacation together? More importantly, will they finally have one? If you're in the mood for funny fiction, a cast of chatty pets, and unsolved murders--read on. Juicy Jersey packs a roller coaster ride of murders, mayhem and mojitos. Come root for Mina, boo the bad guys and nibble a nosh, courtesy of the author’s recipes in the back of the book, vetted by Lund’s real-life favorite chef, her husband, Chef Andrew. Spring is here--finally--and things are looking up! Our intrepid hero, Mina Kitchen, has a new car. Well--it’s new to her. And she even has a boyfriend or two lined up. But that’s because her BFF, Trixie, signed her up on Cupidsbow.com behind her back. Some prospective dates appear a bit odd--but never mind; it’s good to make new friends, right? But all hope of smooth sailing vanishes when Mina hits another bump in the road: she loses her part-time job at Chi-Chi’s cosmetic counter. And Chef Jack hasn’t been scheduling her at Squirrel Run Acres lately, and her catering for James’ massage gigs are replaced by a new, full-time (and gorgeous) assistant. WTH? To make matters worse, her financial calamities become outnumbered by the steady stream of corpses floating her way. Never mind the dead bodies pouring forth from her aunt’s church, St. Bart’s Episcopal--they’re experiencing a new take on mass exodus. Congregation members are trading up at the Pearly Gates quicker than a greased geezer through a glass casket--that is to say, they’re dropping like flies. The grim mortgage reaper looms, when suddenly Mina’s solvency is rescued as she stumbles upon a full-time job. A rather peculiar job, with some definitely peculiar co-workers. Who try to kill her--and Chef Jack. Can Mina finally climb out of her proverbial--and literal--holes? Or will she wind up getting backhoed alongside a maniacal murderer? And where the heck’s a Lavender Cosmo when you really need one? ​Vinnie, her mini mountain lion-sized cat insists everything will turn out fine--but his idea of fine usually revolves around cans of Finicky Fare, and not much else. If you're looking for funny novels, chatty animals (in the guise of pets)--and recipes--read this book.Perfectly Pickled packs sit-com humor with stand-up dialogue, a murder mystery and suspense! You’ll cheer for Mina; hiss at the bad guys and sip your very own Lavender Cosmo along the way, courtesy of the author--the recipe’s in the back of the book, along with others, all vetted by Lund’s real-life favorite caterer, her husband, Chef Andrew. Valentine’s Day stinks - literally - after a shift at The Shrimp Shack, getting showered with a vat of marinara and being haunted by a messy ghost. The romance holiday looms large for Mina Kitchen - a forty-something single without a boyfriend in sight, and a catering disorder to beat the band. Everyone else is all set: even her Swiffer-addicted neighbor Vito (the ex-leader of the Moils, the Jewish-Polish Family from Bumville, New Jersey) has a significant other. Who knew? And then there’s her best friend Trixie. She’s got a steady boyfriend, and a full time job with plenty of OT, too. She’s even quit smoking! Except now she’s a jelly junkie. Well, not just jelly - any sweet will do. What’s a girl to do? Set her sights on handsome Chef? Or dare a flirt with juicy James? Who you gonna call? GumBuster! Wait, that’s just one of Mina’s new part time jobs. Romance fills the air (or is that fried chicken?) but dates remain elusive as a series of mysterious thefts rattle the shop owners of Lancaster "Pee-Ay". Can mild-mannered Mina land a full time job, a boyfriend and save Trixie’s waistline without getting konked by some creepy crook? 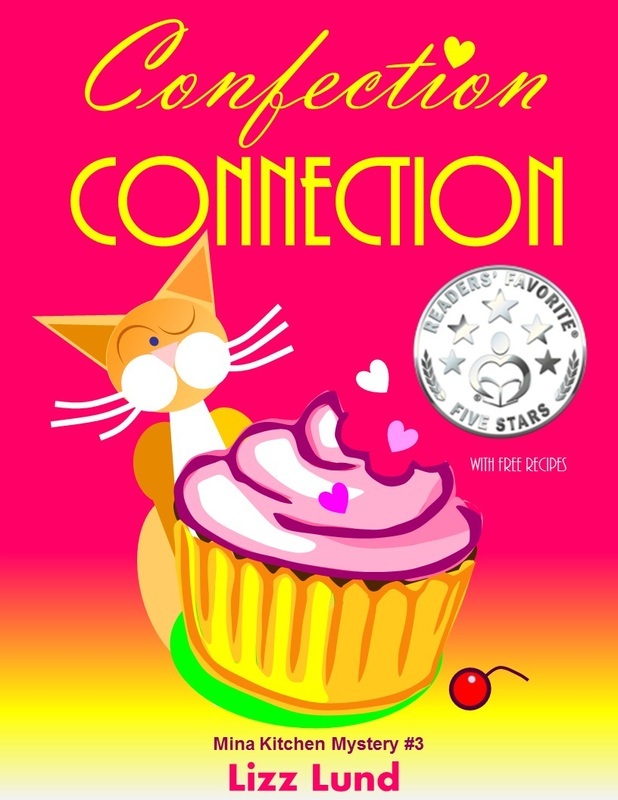 Confection Connection is packed with laughs, mysterious thefts and a ghost - with a cherry on top - recipes. Set in Lancaster, “Pee-Ay” you’ll discover quirky characters, hysterical dialogue and funny surprises simmering away. Have you read Christmas Bizarre? Curious about Lizz's other offerings? Try a short sample - with free recipes! Kitchen Addiction! – Recipes is a storybook cookbook introduction to Kitchen Addiction! – the 1st in the Mina Kitchen series. It contains many chef created recipes – courtesy of Lizz's husband, Chef Andrew Mark – as inspired by Vito Spaghetti’s oddball creations in the story. What do Santa’s Sidekick, a dead lawyer and a geriatric vampire have in common? Meet Mina Kitchen – a forty-something single who finds trouble quicker than she can whip up a batch of breakfast breads. Plural. Her catering disorder runs neck-and-neck with her weird luck, and her cat’s weirder tendency toward gnawing elf gear. Okay, and getting kidnapped a couple of times in one week is a little strange, too. Her next door neighbor Vito's past as ex-leader of the Moils, the Jewish-Polish Family from Bumville, New Jersey, comes to light and throws a dollop of dilemmas into an already simmering plot. Top it all off with a counterfeiting ring, a county-wide dearth of holiday wrapping tape, and a mass of pets running loose at the local mall, and what do you have? A recipe for disaster that Mina whips to a froth. Christmas Bizarre will keep you smiling when you’re not shouting up a belly laugh. Set in Lancaster, “Pee-Ay” you’ll discover a lively cast of characters, funny dialogue and lots of twists and turns. Hang on tight – you’re in for a slalom of a holiday ride. 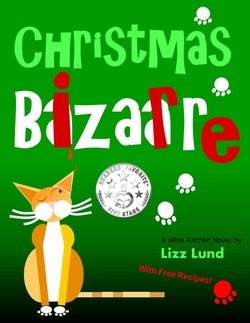 Christmas Bizarre is packed with delightful surprises - along with a bonus of free recipes, vetted by Lund's chef husband, for your own culinary creation and consumption. Double the fun with Bundle #1! Lund's first 2 novels of the Mina Kitchen series combine for delightful reads - and treats! Recipes are included at the end of each novel, per Lund's husband, Chef Andrew Mark. “…Kitchen Addiction is a "Must Read" light hearted comedy, perfect for the beach or a snowy day in front of the fireplace. You won't want to put it down. I finished the story last night & realized I would miss Mina's adventures. Meet Mina Kitchen, a forty-﻿something ﻿single who likes to cook - and cook and cook. In fact, her zest for whipping up trays of canapes is dwarfed only by her weird luck and mountain-lion size tabby cat, Vinnie. That, and her godmom's tendency for blackmailing new members into joining St. Bart's. Okay, maybe Mina's Swiffer-addicted neighbor, Vito, is a bit weird, too. As if all that wasn't enough, Mina's a Jersey girl transplanted in the midst of the Amish-flavored countryside of Lancaster, PA. Things get really complicated when she learns that her neighbor Vito is in a witness protection program, and her dry cleaner deals in prescription samples. Throw in a few mysterious flaming feces flingers and a fuse box labeled in Arabic, and you have a recipe for catering disorders. Kitchen Addiction! will keep you smiling when you're not LOL-ing. Set in Lancaster, Pennsylvania, you'll find a surprising cast of characters, humorous plot twists, red herrings and actual recipes. Well, some of the recipes are real. The others you might to take with a pinch of salt, and some Tums. If you're looking for a funny fiction read, packed with humor, excitement - and recipes - look no further. Lund's debut "chick lit" novel blends fun characters, great dialogue and zany capers into a frothy fiction that's sure to amuse. The novel also delivers a virtual tourist romp through the actual streets of Lancaster City and its surroundings.